A perfect weekend getaway into the arms of nature and quietude is Nagarhole National Park. From deep valleys to small waterfalls and rich plains to dense forests, this place has everything which an avid nature lover wishes for. How about getting lost in the lively atmosphere of Nagarhole National Park? 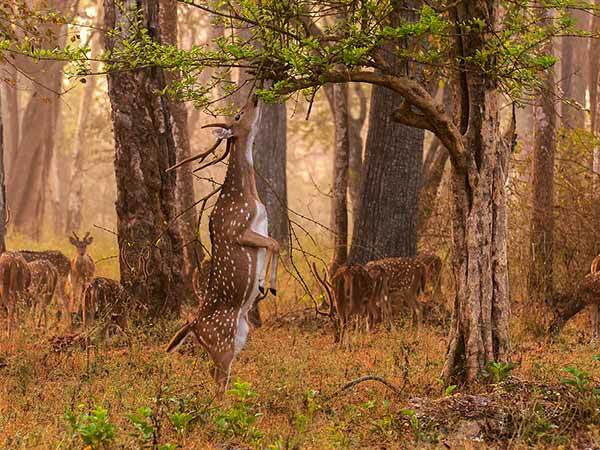 The liveliness of Nagarhole lies in its wildlife beauty spread all across the Western Ghats. From rare animals to endangered birds, you can savour each and every minute of your time once you are roaming in and around this beautiful lively environment of Nagarhole National Park. Nagarhole experiences the tropical type of climate and hence, it can be visited throughout the year. However, if you are looking to be in a comfortable environment and not get disturbed by its climatic factors, then the best time to embark on your journey to Nagarhole National Park is from October until the end of April, when the temperature is optimum and other climatic conditions are favourable, letting you savour the best of this national park. By Air: You can take a flight to Mysuru and then from there take a cab to Nagarhole National Park. Mysuru airport is at an approximate distance of 100 km from Nagarhole. By Rail: There are no direct trains between Nagarhole and Chennai. However, you can catch a train from Chennai station to Mysuru and then from there take a cab to Nagarhole National Park. By Road: Situated at a distance of about 560 km from Chennai, Nagarhole National Park is easily accessible by road from Chennai and other major cities. You can take a cab from Chennai to Nagarhole National Park or take a bus from Chennai to Mysore and then take a cab to Nagarhole. If you are commuting on your own, then you can take the following route. Once you are on your way to Nagarhole, you can explore and take a break at the following places. Situated on the banks of Vegavathi river, Kanchipuram is well known for its ancient temples and Kanchipuram silk. If you are looking forward to exploring the fine art of architecture of the temples and historical buildings, then Kanchipuram is a must-visit place for you. You can also get home the finest of silk from Kanchipuram. How about stopping at a perfect destination en route, which provides its tourists with the best of beauties? Be it regarding natural marvels or yesteryears' pride, Vellore is home to numerous attractions, which an ardent traveller wishes for. In other words, Vellore can also be called the complete package. So, why not rest yourself in this beautiful town of nature, history and spirituality? One of the major cities in India, Bengaluru, is known for IT sectors as well as its natural beauty. From modern architecture to historical monuments and exotic gardens to surreal lakes, this hi-tech city of India is one of the major tourist destinations throughout the year. How about stopping at Bengaluru while on your way to Nagarhole and witnessing its marvellous charm amid urbanity? Famous for its incredible Mysore Palace and rich heritage, Mysuru is one of the most-visited destinations in South India. Also known as the Cultural Capital of Karnataka, this historical town has its legend emerging from each and every corner of its settlement. Today, Mysuru is quietly popular for its sweet dish, Mysore pak and brands, such as Mysore Sandal. How about taking a break at this town of rich culture and heritage? Also known as Rajiv Gandhi National Park, Nagarhole National Park is located in the Kodagu and Mysuru district of Karnataka. Over a period of time, it has become home to certain rare and endangered species of plants and animals and has also been declared a tiger reserve. If you are looking to spend some time amid the authentic beauty of wildlife and nature, then Nagarhole National Park is the ultimate destination for you. You can also savour the presence of certain small waterfalls, valleys and tiny hills which collectively make Nagarhole National Park an ideal destination for all the picnic goers and nature lovers. Covered mainly with deciduous forests, the major part of fauna includes rosewood, teak, sandalwood and plants like clumping bamboo. Apart from plants and trees, you also have the opportunity to witness the best of wildlife in the form of sloth bears, Bengal tigers, Indian leopards, barking deer, etc. So, how about taking a break at Nagarhole National Park with your family and friends to get surprised by its rich beauty and vibrant atmosphere?